THE FUTURE OF House of Fraser’s Dublin outlet hangs in the balance after British group Sports Direct acquired the troubled department store’s UK assets. In a statement to the London Stock Exchange, Sports Direct, which is majority owned by Newcastle United proprietor Mike Ashley, said it has snapped up House of Fraser for a cash consideration of £90 million. It said it has acquired “all of the UK stores of House of Fraser”, the company brand and all of the stock in the business. A spokesman for Sports Direct confirmed to Fora that the deal excludes the chain’s Dundrum Town Centre outlet, which casts doubt on the future of the Dublin outlet. The company also operates international outlets in Abu Dhabi and Nanjing, China. 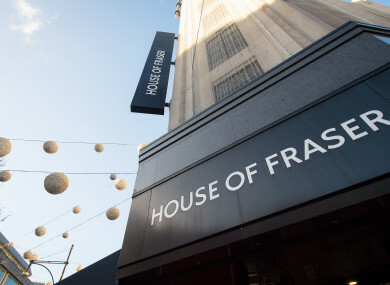 Earlier today, House of Fraser – which was controlled by Chinese conglomerate Sanpower prior to the Sports Direct buyout - announced that it was planning to enter administration. The 169-year-old firm, which has department stores dotted mostly across Britain and Ireland, currently employs about 17,500 staff. Some 6,000 jobs were previously on the chopping block in an overhaul that had been unveiled in June. At the time, it said it was shutting 31 of its 59 stores. Its Dublin and Belfast units weren’t marked for closure at that stage. House of Fraser revealed last week that it had lost a proposed investment from the Chinese owner of Hamleys and was looking for a new rescuer. The group had announced a drastic restructuring after agreeing a 51% sale to China’s C.banner International Holdings, which already owns the London toy retailer Hamleys, for £70 million. However, C.banner said a slump in its own share price had rendered the transaction “impracticable and inadvisable”, and it axed the deal. UK-based retailers with large amounts of stores are suffering from fierce online competition from the likes of Amazon, while battling against discounting in big supermarket chains. Bankrupt British budget chain Poundworld collapsed earlier this year with the loss of some 5,100 jobs. It was announced yesterday that the Irish family that set up the pound shop chain in the Republic agreed to buy the remaining stores from the troubled retailer. Meanwhile, thousands of jobs have also gone with the demise of clothing outlet Calvetron, Toys ‘R’ Us toy chain, Maplin electronics stores and Warren Evans bed manufacturers. Email “Sports Direct just bought House of Fraser - but its Dublin store still hangs in the balance”. Feedback on “Sports Direct just bought House of Fraser - but its Dublin store still hangs in the balance”.